Blast Off International was founded as a private company in 1958 after the development of the TRUE all purpose cleaner on the market. For more than six decades, the company has been family owned and operated. Blast Off®, founded in 1958, is a privately owned chemical company, which produces and sells an ethically and socially responsible all purpose cleaner. Founded by Earl Smith after repeated frustrations with available all purpose cleaners, the company today still follows its original ethos of providing an environmentally safe, premium quality all-purpose cleaner for military-strong, family-friendly, guilt-free cleaning. With offices in North America, Europe and Asia, Blast Off® continues to grow and expand into new markets with new product use cases discovered every day. 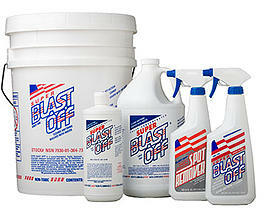 Blast Off® has been the United States Navy’s primary on-ship cleaner for several decades. We are very proud to support missions at home and abroad by the world’s finest military. Today Blast Off® remains a family-run company with Earl Smith still serving as Chairman and Founder. The company now has three generations serving in corporate positions around the United States. Following our founder’s guiding principles, the company vigorously retains its small business mentality and family roots in order to maintain quality and provide the most competitive prices possible.